Buonaventura is my great grandfather, and while he died more than 45 years before I was born, he is the inspiration for this family history project. Growing up in Watertown, I do not recall much of anything ever being said about him -- most likely because not a lot was known about him. 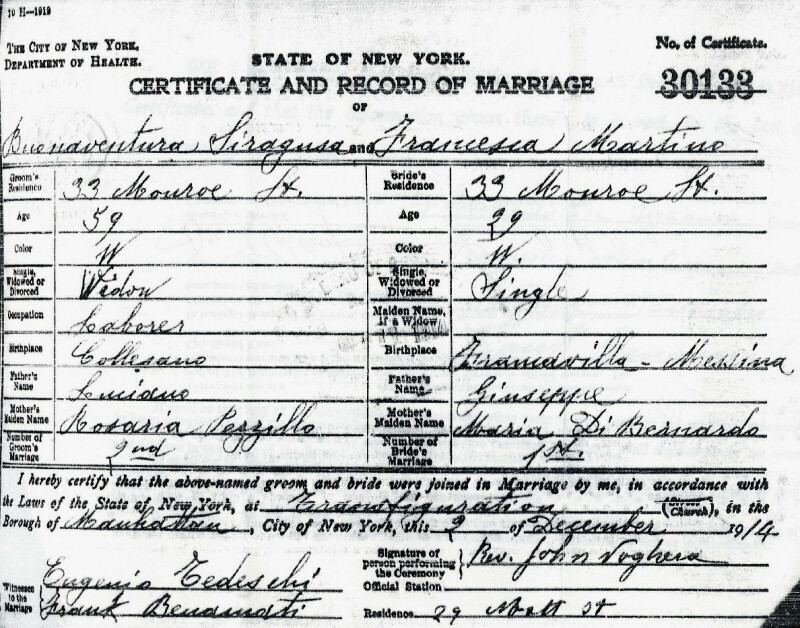 His children were all very young (ages 11, 9, 6 and 2) when he passed away in 1921, and as my great grandmother Francesca re-married the next year, a new combined Siragusa-Scudera family soon became the focus. I first remember hearing Buonaventura's name from my cousin Bob Comenole when I was in high school and he asked me if I knew that our great grandfather was buried in the Arsenal Street Cemetery, one of Watertown's oldest burial grounds dating back to the early 1800s. Shortly after that conversation I visited the grave and remember thinking how ironic it was that he was in this cemetery (located on one of the busiest streets in the city) that I had passed by hundreds of times -- never really giving much thought to its significance or place in our family's history. I moved away from Watertown not long after that discovery, but would always have his name in the back of my mind and a curiosity for the rest of the story. In the summer of 2002, while visiting my grandfather for the final time before his death, he showed me a photograph of his father that he had recently found. Displayed in an antique oval bubble glass frame, there was a magnificent portrait of Buonaventura Siragusa, the man that began our family's American journey. He told me that his father was very respected among friends and acquaintances, who would often seek his help in reading and understanding important documents. Instantly, my curiosity was renewed. Born in Collesano, Sicily on the 22nd of May in 1856 to Luciano Siragusa and Rosaria Pizzillo, Buonaventura was named after his father's father, in accordance with the centuries-old Italian tradition of giving the first born son the same name as his paternal grandfather. The Siragusa family was well established in Collesano, having roots in the small town dating back to the 17th century. Buonaventura's father Luciano was a simple farmer (contadino) as were a great many of the inhabitants of rural Sicily. As his family grew up, and likely encouraged by the stazzonaro tradition of the Pizzillo family, Luciano began to work as a potter (figulo) and was joined in business by his sons Buonaventura and Stefano. My great aunt Nancy Siragusa Doherty recalls stories of her father's work in their Sicilian brickyard where "the factory made canals, which are curved roof tiles, and matunas [mattoni], which are bricks for piazzas. One brother would work with the father to make the merchandise while the other would sell and deliver it using a horse and two-wheel cart." With Luciano and Buonaventura as figuli and Stefano as vetturale, the family worked side by side -- just as they had done as contadini. At the age of 24, probably close to the time this photo was taken, Buonaventura married Domenica Alfonzo in November of 1880. By the next summer, they began a family with the birth of their first daughter Salvatora Rosaria Siragusa. 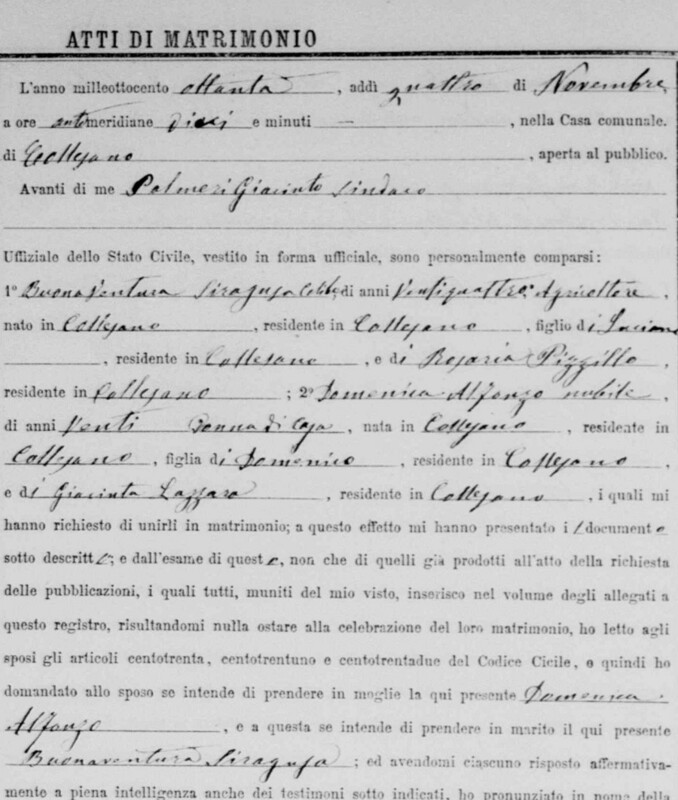 Two more daughters followed, Giacinta in 1883 and Anna in 1889. All three would eventually come to America. While they were blessed with three healthy daughters, life for Buonaventura and Domenica was not without heartache. Between 1885 and 1899, they lost five children -- a daughter Maria, son Salvatore and three other sons, all named to honor his father Luciano. Tragically, Domenica died in January of 1899 shortly after giving birth to the third Luciano baby, who would only live for four months. Suddenly, Buonaventura and his three daughters, aged 10, 16 and 18, were alone. The months after Domenica's death were a turning point in Buonaventura's life. 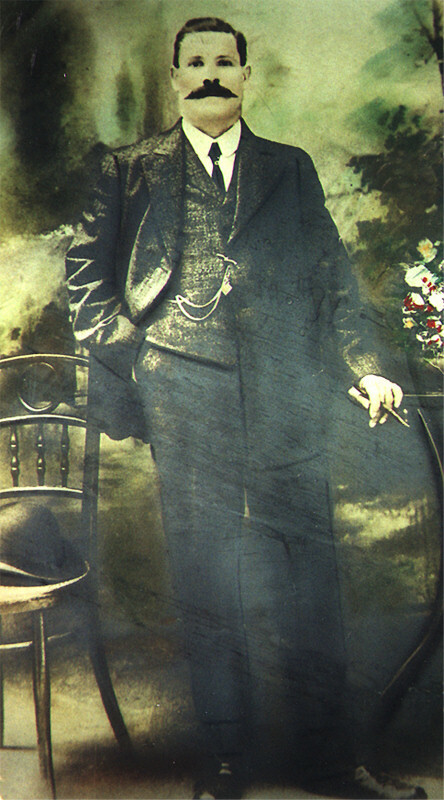 His beloved father Luciano passed away in the spring of 1899, and his mother Rosaria, the next year in 1900. It was the beginning of the 20th century and a great wave of immigrants were arriving in New York day after day on ship after ship. Whether or not America was always in the plans for his family, the decision to leave Sicily and start a new life quite likely became much clearer after the great losses he and the girls had suffered in the last year. 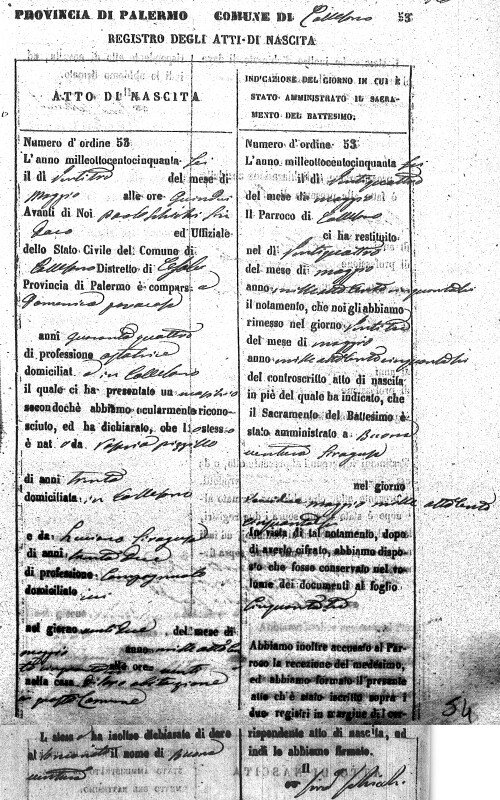 Author's Note: Buonaventura's history in Sicily is well documented as the Italians were excellent record keepers both in terms of the Napolean-influenced civil records that began around 1810 and in church records in the centuries before that. Ironically, it is when he comes to America that the records become more elusive and in some cases nonexistent. My intention throughout this family history project is complete accuracy, and to only publish material based on primary sources. Occasionally, as in the case of Buonaventura's Ellis Island record, you must make a "genealogical leap of faith" based on the best information available. New York may have been 4,400 miles from home, but in the Italian neighborhoods of lower Manhattan, there were familiar names, sounds and faces as wave after wave of Italian immigrants settled in the area. During his decade in New York, Buonaventura lived on Mulberry, Oliver and Monroe Streets. In the fall of 1901, 18 year old Giacinta joined her father in America. Brother Stefano arrived in 1902, youngest daughter Anna in 1903, and finally his oldest daughter Salvatora and her family in 1905. Buonaventura and Stefano's youngest brother Giuseppe also came to the United States (1909), but not much is known about him at this time. Mulberry Street was a common thread in many of the lives of my Italian ancestors. The boarding house at 38 Mulberry Street, where Buonaventura lived when the first of his family arrived, was also an early home to the Dellutri family. Calogero and Carmelo Dellutri (originally dell'Utri) would join our family in 1904, when they married Buonaventura's daughters Giacinta and Anna in wedding ceremonies at the Church of the Transfiguration just a few days apart in March of that year. Nearby at 3 Mulberry Street, Salvatore Malatino welcomed the arrival of his sister Francesca from Francavilla, Sicily in the spring of 1906. This Mulberry Street connection would lead to the next chapter in widower Buonaventura's life. My great grandparents both grew up in small towns in rural Sicily, about 65 miles apart. They had led very different lives up to the point where they met in New York's "Little Italy" neighborhood. Ventura, as he was less formally know, was 30 years older and already a grandfather when Francesca came into his life. Francesca was a young woman, just 20 years old, when she made the journey to America with her younger brother and nephew. The difference in age and life experience did not matter -- Sicily, and a fresh start in America, was their common bond as they began a new family together. Ventura and Frances (her Americanized name) had four children: Charles (1910), Nancy (1912), Joseph (1915), and Bonaventura "Benny" (1919). They continued to live in the Italian neighborhoods of Manhattan as their family grew and were married on December 2, 1914 at the Church of the Transfiguration, just a half mile from their apartment at 33 Monroe Street. It is likely that their delay in getting married was due to obtaining proper documentation from Sicily to confirm the death of Buonaventura's first wife. After nearly two decades in America, the time had come to leave the overcrowded streets of New York for the relative wilderness of Watertown, 300 miles upstate. 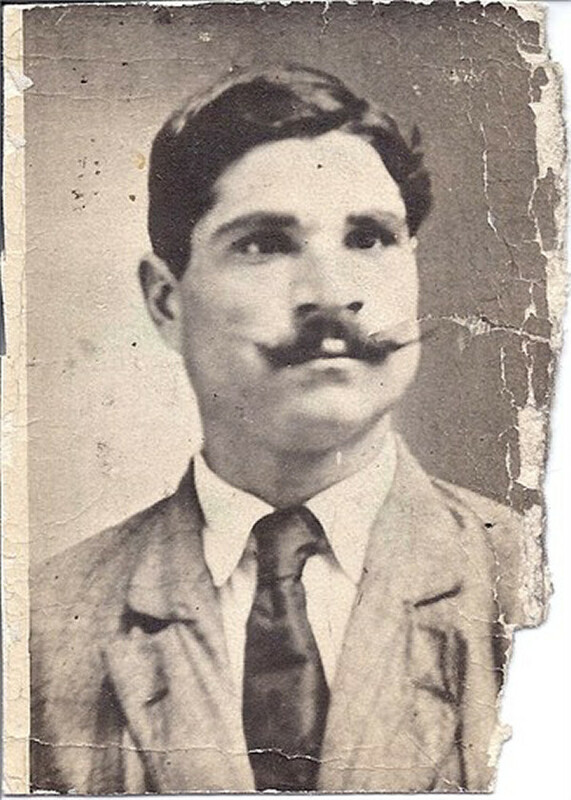 Francesca's brother Salvatore Malatino had taken that same path with his family a few years earlier, and so the Siragusas followed around 1918. 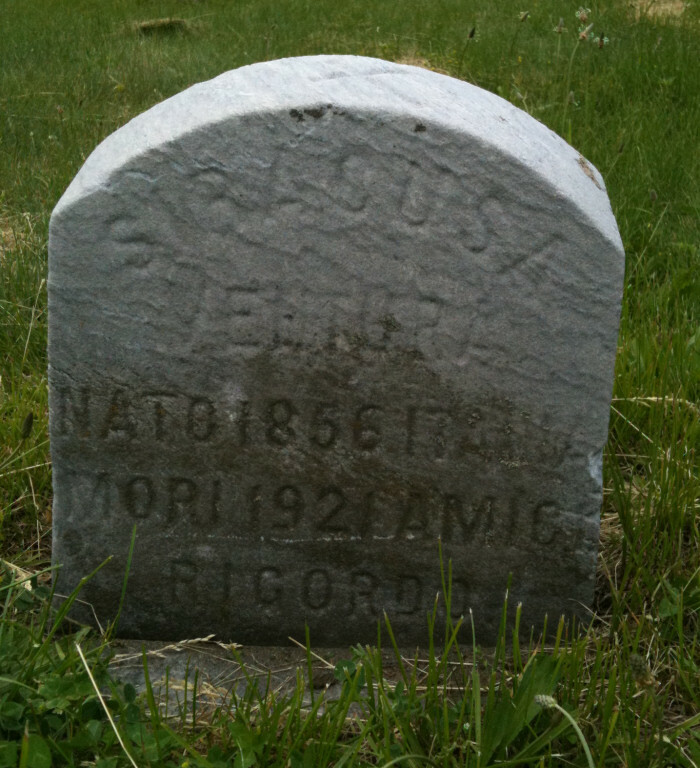 Almost 100 years later, you will still find the Siragusa name in Watertown. Northern New York offered a new way of life and a chance for home ownership as they settled on Palmer Street, one street over from the Malatino family on Ash Street (later renamed Bellew Avenue). Ventura's time in his new home was short-lived. He became ill in early 1921 and battled a stomach ailment for several months. On August 24, at the age of 65, Buonaventura Siragusa died at his home on Palmer Street and was laid to rest at the Arsenal Street Cemetery. His grave, just steps from the sidewalk, is within sight of the home where his son Joseph lived for most of his life. The inscription on the headstone reads Amici Ricordo, Your Friends Will Remember You. 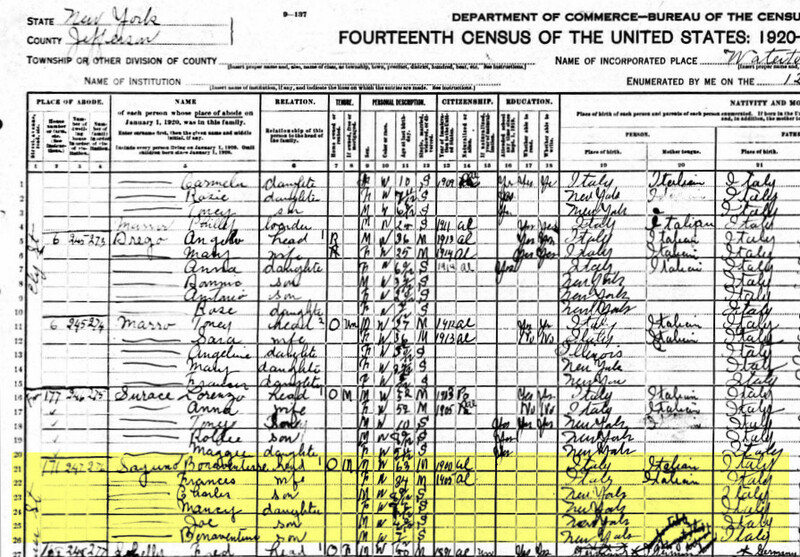 Click the links below to view documents from Italian civil records, U.S. census logs, etc. 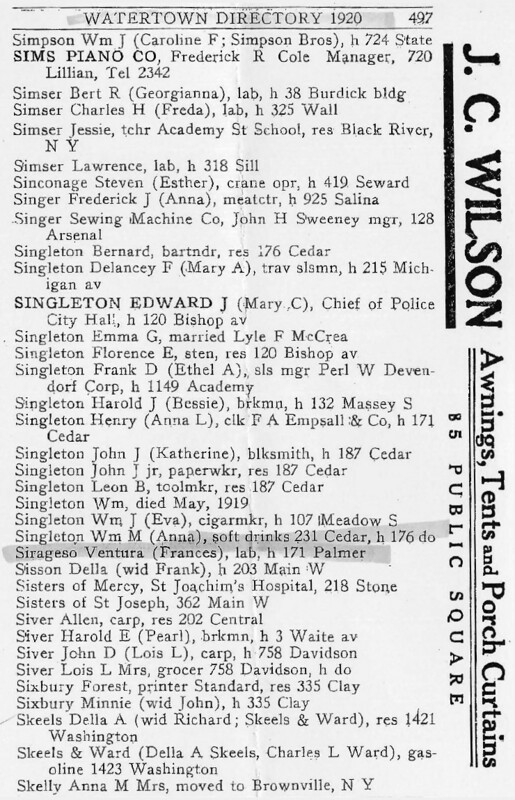 Note the multiple misspellings on all of the American records (which lead to incorrect indexing and making it difficult to find these records with a traditional search). 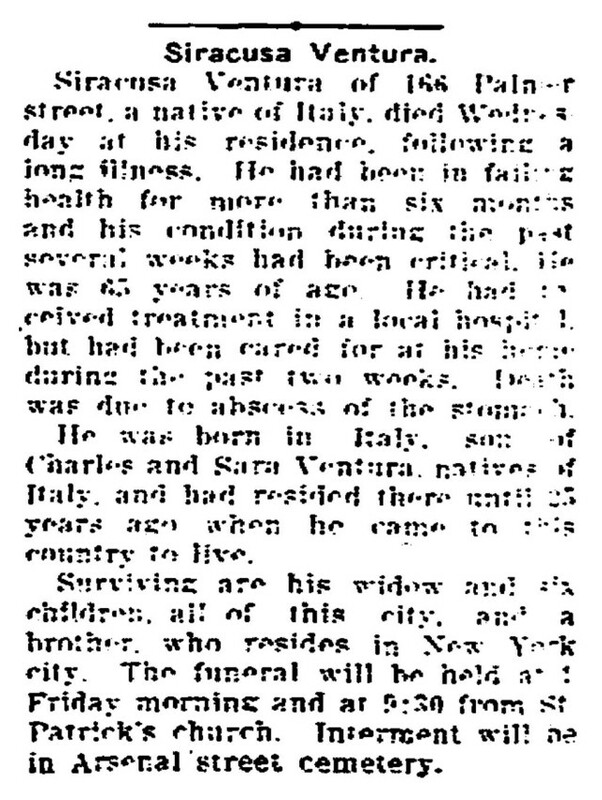 Obituary for Buonaventura Siragusa (Watertown Daily Times, printed Thursday, August 25, 1921) Author's Note: Finding an exact date and record for Buonaventura's death has been one of the most elusive tasks in the entire project (so far). After more than a year searching for this information, I finally came across this article from the Watertown Daily Times. It is filled with errors, beginning with the NAME! The headline reads "Siracusa Ventura" and the story further leads you to believe that his last name is Ventura as his parents are shown to be "Charles and Sara Ventura" (instead of Luciano Siragusa and Rosaria Pizzillo). Also incorrect are the home address, number and location of children, and his years in the United States. Despite the errors, it is indeed his obituary and provides some finality to his story.